Prof. Jakosky teaches undergraduate and graduate courses in both Earth and planetary geology and extraterrestrial life, including both the science and the societal and philosophical issues relating to the science. His research interests are in the geology of planetary surfaces, the evolution of the Martian atmosphere and climate, the potential for life on Mars and elsewhere, and the philosophical and societal issues in astrobiology. He has been involved with the Viking, Solar Mesosphere Explorer, Clementine, Mars Observer, Mars Global Surveyor, Mars Odyssey, and Mars Science Laboratory spacecraft missions, and is involved in planning future spacecraft missions. 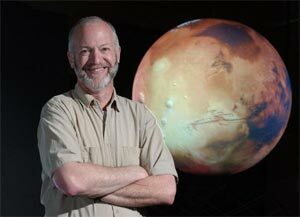 He heads up the University of Colorado’s team in the NASA Astrobiology Institute. He has published more than 100 papers in the refereed scientific literature. His book “The Search for Life on Other Planets” was published in 1998 by the Cambridge University Press, and “Science, Society and the Search for Life in the Universe” was published in 2006 by University of Arizona Press. He serves on numerous national advisory committees. He serves as Associate Director for Science in the Laboratory for Atmospheric and Space Physics at the University of Colorado.